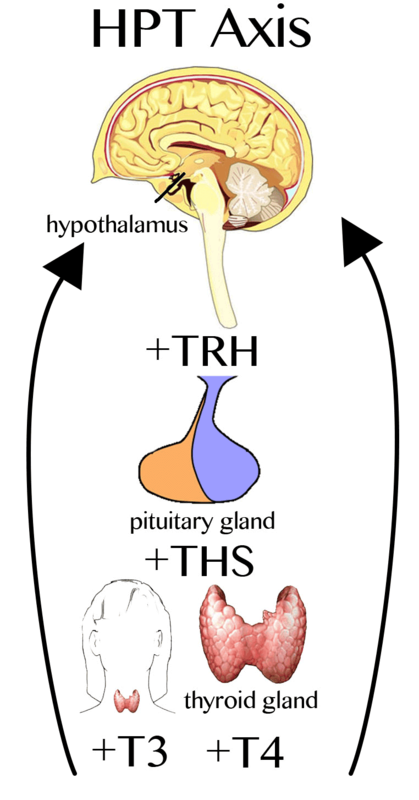 The hypothalamus, a small part of the brain above the pituitary, produces thyrotropin releasing hormone (TRH). Low levels of thyroid hormones in the blood are detected by the hypothalamus and the pituitary. TRH is released, stimulating the pituitary to release TSH. Increased levels of TSH, in turn, stimulate the thyroid to produce more thyroid hormone, thereby returning the level of thyroid hormone in the blood back to normal. The way a goiter forms in those geographic areas of the world which have a deficiency of iodine is a good example of how the axis functions. Normally, TSH increases the uptake of iodine by the thyroid gland and increases production of thyroid hormone. If there is little iodine available in our diet, insufficient thyroid hormone is produced by the thyroid; hypothalamic TRH causes TSH to be released from the pituitary in large amounts. The pituitary also responds directly to the lack of thyroid hormone in the blood and TSH is increased. This enables the thyroid to capture most of the iodine presented to it from food and water. 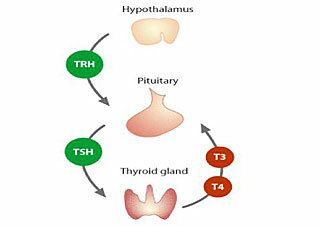 TSH has a second action — it causes growth of thyroid cells. The gland grows and becomes very large under the influence of this high level of TSH secretion. Therefore, most people who live in iodine deficient areas have goiter, thus allowing them to produce enough thyroid hormone for normal body function. 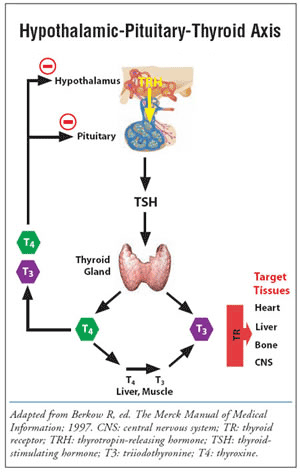 Once thyroid hormone levels are restored, TSH secretion stabilizes at a high level. In healthy individuals and in those with goiter, the hypothalamic – pituitary – thyroid axis maintains thyroid hormone production at a finely controlled level and enables the thyroid to respond to situations requiring more or less thyroid hormone production. The main hormone secreted from the thyroid gland is T4, which reaches the peripheral organs and is converted to T3 by deiodinase. T3 enters the cell nuclei and binds to thyroid hormone receptor ? and ? isoforms on targeted genes, thereby regulating gene transcription. Thyroid hormone receptors act on the targeted genes as either heterodimers with the retinoid X receptor or as homodimers. Meanwhile, secreted thyroid hormone reaches the hypothalamus and the pituitary, where it inhibits production and secretion of TRH and TSH, thereby establishing the hypothalamic-pituitary-thyroid axis. If any factor in this axis is disturbed, hypothyroidism will occur.